Dear Newfoundland-friends! - Neufundländer "Bär vom Ermstal"
It was back in the year 2000 when we fell in love with this impressive breed with their endearing charme and thus we are breeding Newfoundland dogs since 15 years, organized in the DNK (Deutscher Neufundländer Klub) and the VDH/FCI. From the first day our breeding objective has been to raise healthy and strong ‚family-bears‘. 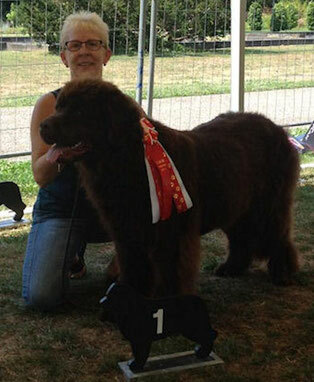 Our ambition always is to support prospective Newfie-owners with our expert knowledge as breeders and breed-warden. Rowitha’s function as breed-warden within the DNK (Deutscher Neufundländer Klub) allowes us to collect many inside information about our breed. And we’d love to pass this knowledge onto you.